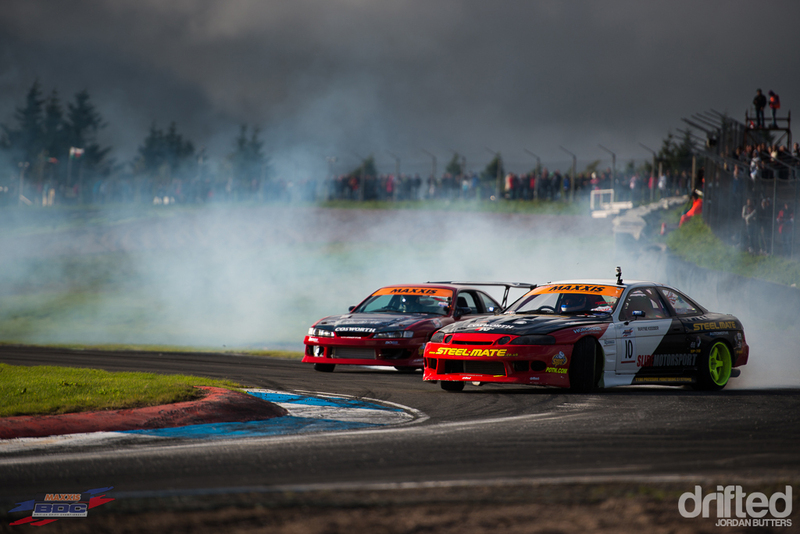 The final round of the 2013 Maxxis British Drift Championship saw the BDC roadshow heading north (really far north) to Knockhill Circuit in Fife, Scotland. 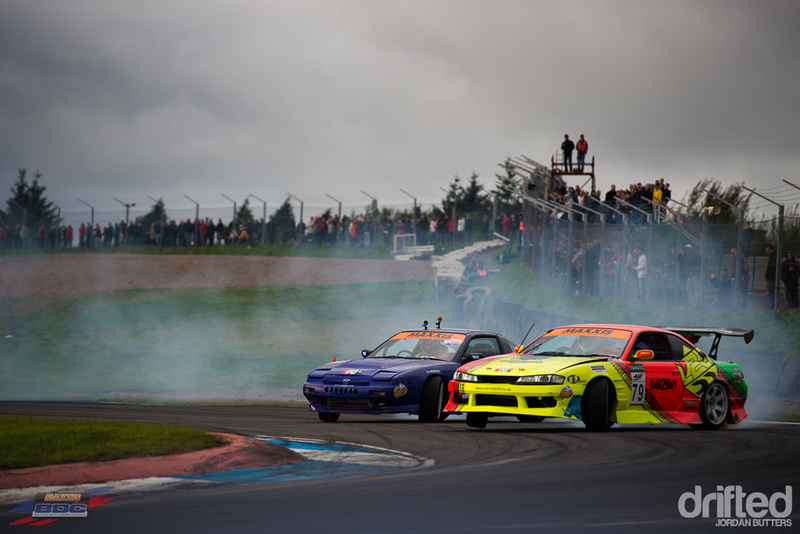 The BDC has been a regular event at Knockhill and always draws a big crowd. 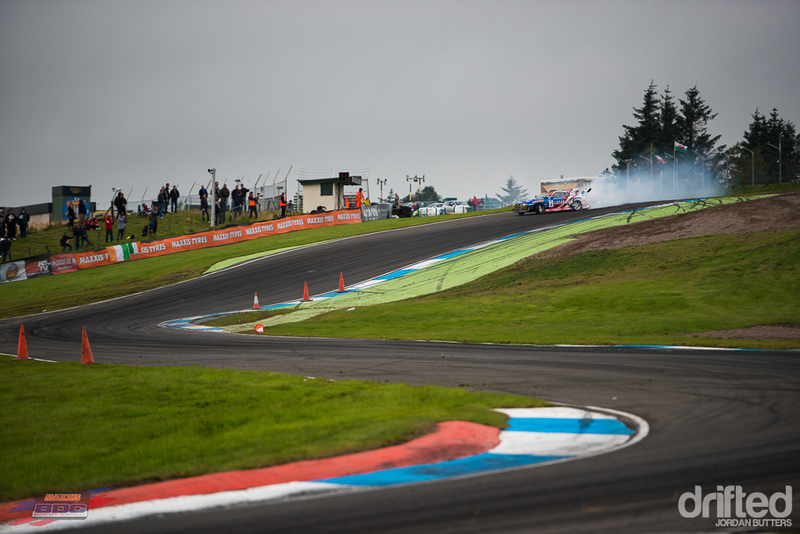 Knockhill’s unique feature is ‘the hill’, a blind crest over which the competitors must initiate at full chat. 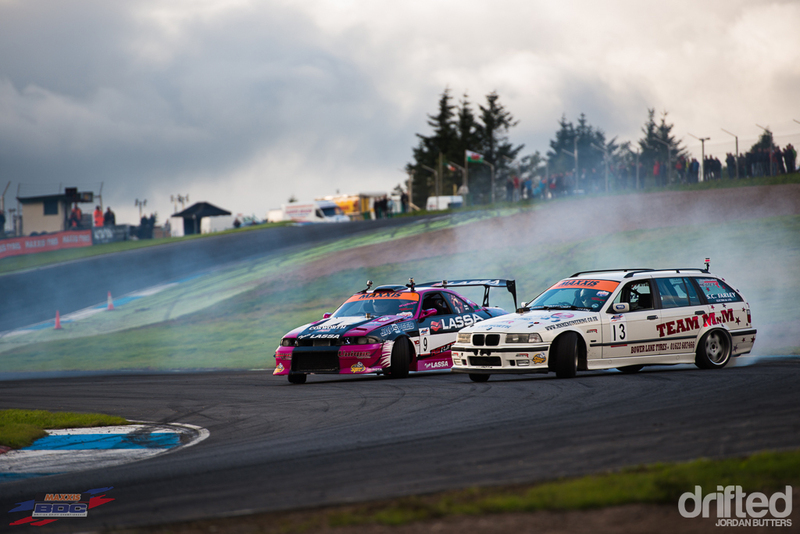 To mix things up this year the judges specified a different line – following the decent around to the right, drivers must before a quick, snappy transition to the left, hugging the inside of the circuit. 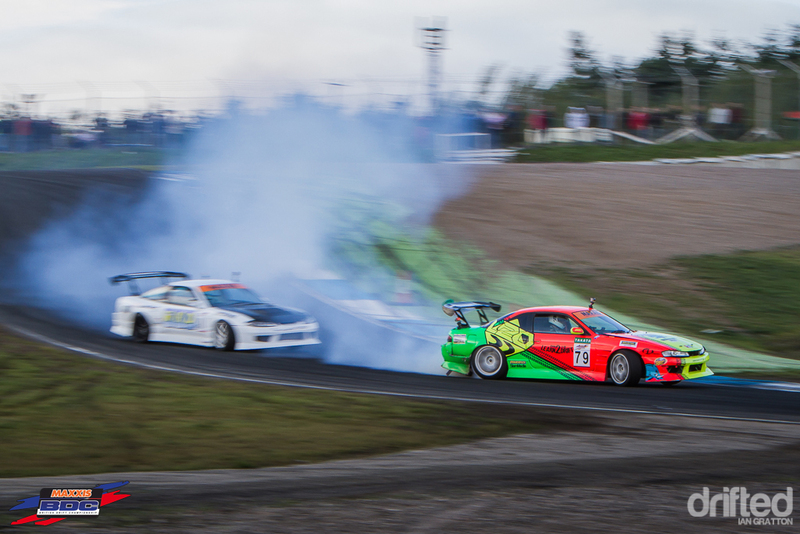 The natural line here is to left the car wash to the outside of the second turn, but due to the high number of off-track shenanigans that this promotes, the new line was deemed necessary by both circuit owners and organisers alike. 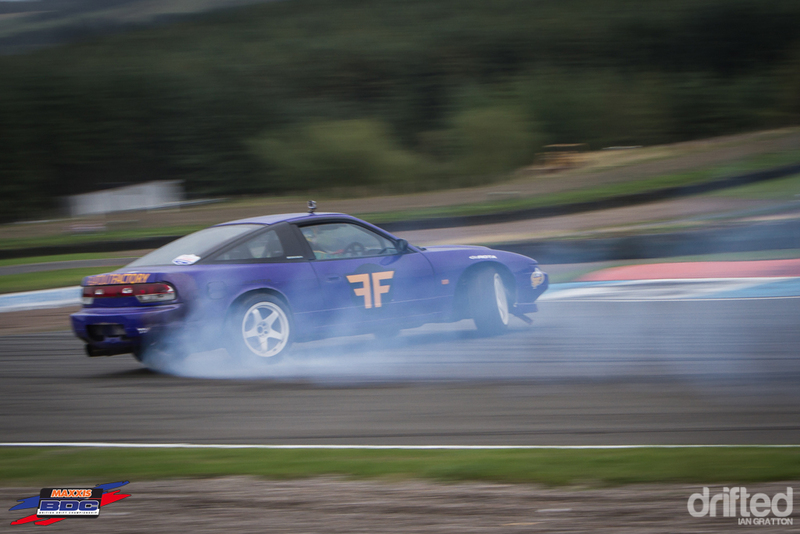 …the drivers getting back on the throttle quicker after the first transition and carrying more speed due to the reduction in angle. 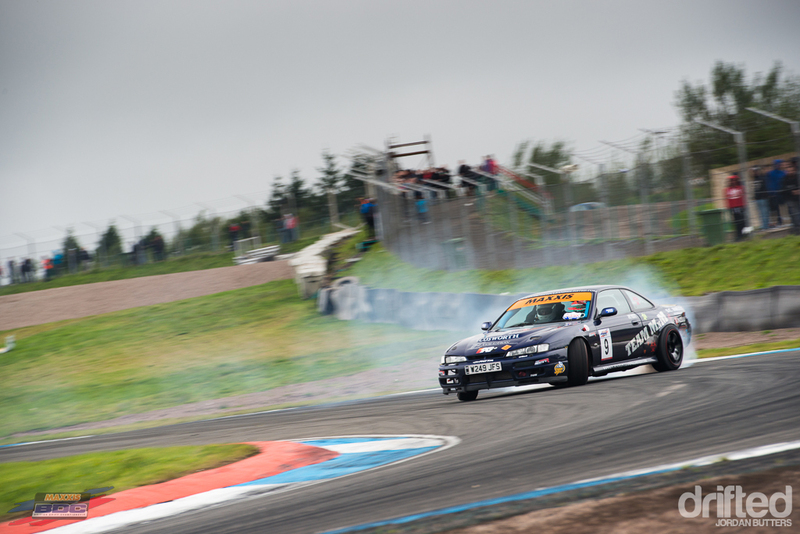 One characteristic that can’t be ignored at Knockhill is the weather. 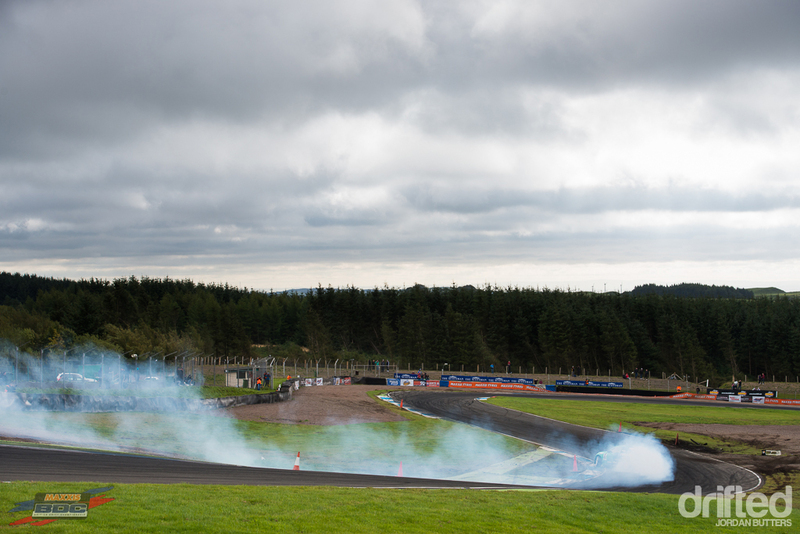 Conditions can go from stormy skies and heavy rain to glorious sunshine and back to blowing gales in a matter of minutes, due to the circuit’s surrounding geography and location. 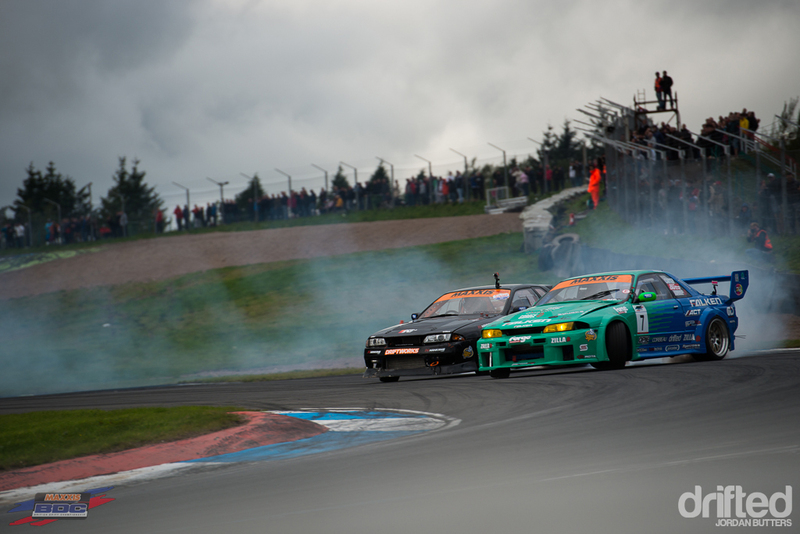 Another unique point about Knockhill is the beautiful setting in which it sits. The vantage point from the top of the hill offering a view over the countryside towards the River Forth and the famous Forth Bridge. 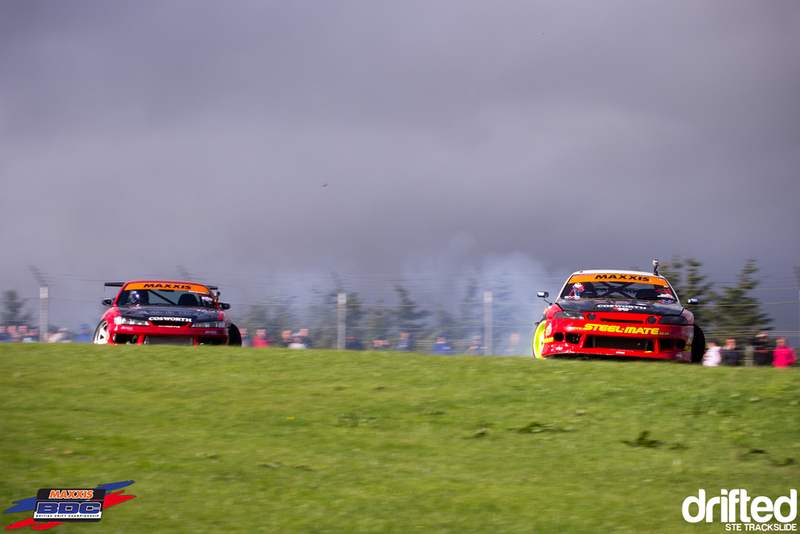 I wonder if the drivers have time to take it all in when plummeting sideways off the drop? Probably not. 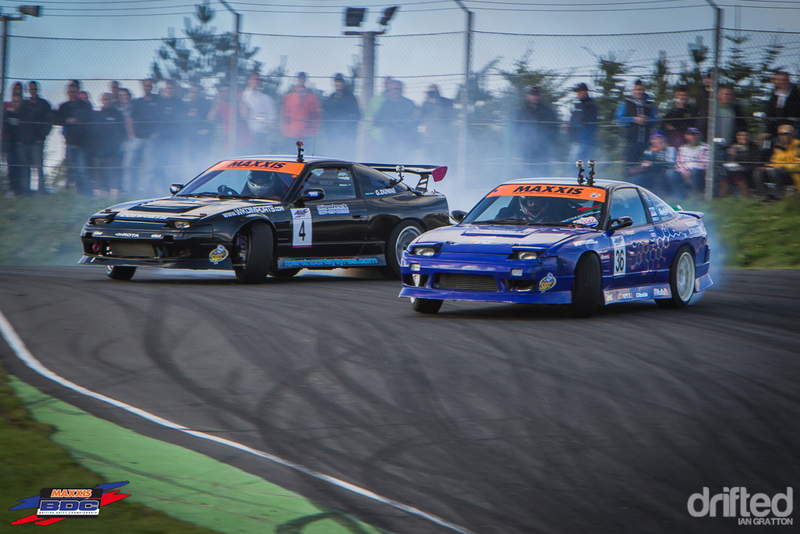 Coming into the final round the Super Pro championship was wide open, with a number of drivers vying for the top spot. 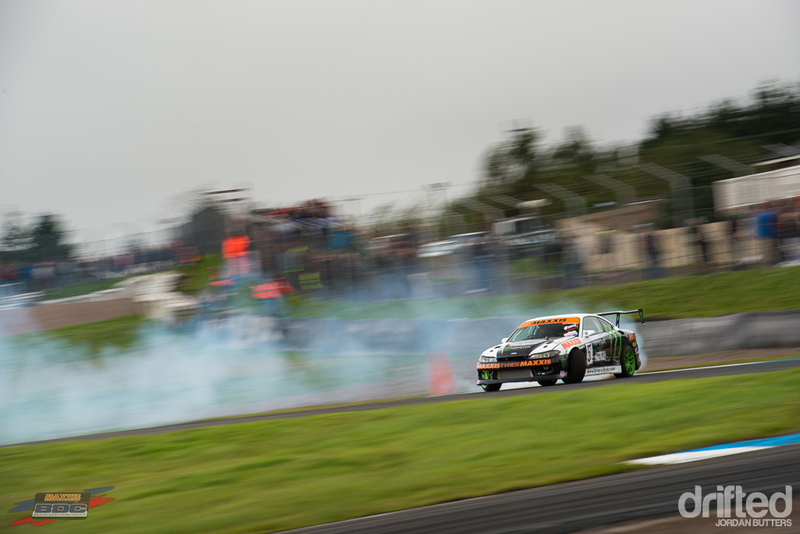 One contender who’s season ended earlier than expected was Lucas Oil driver Mark Luney, having failed to make the cut in qualifying, his championship hopes went up in smoke. …and Brett Castle’s luck went from bad to worse. 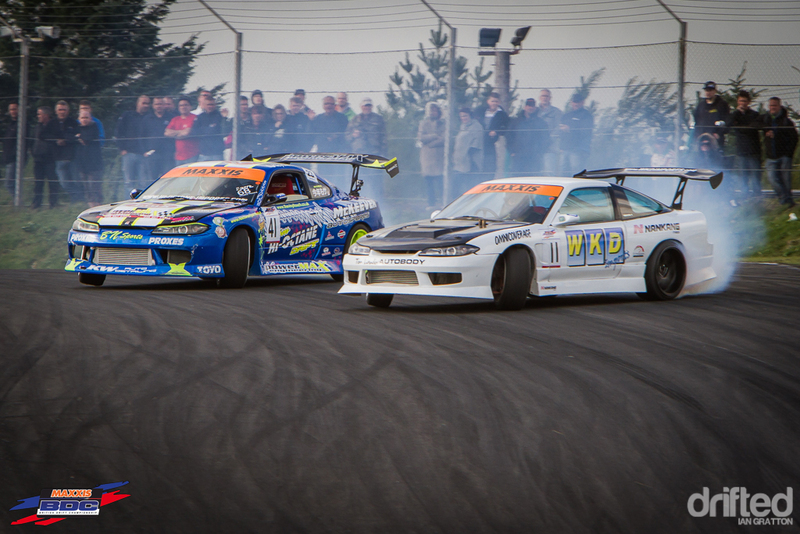 After retiring the Japspeed Subaru due to mechanical issues at Lydden Hill, Brett piloted the 2JZ Lexus. 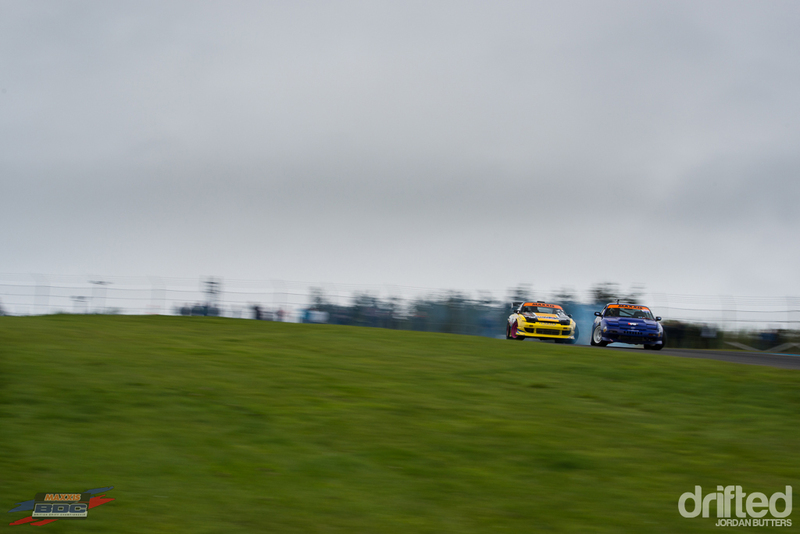 More mechanical problems meant a lack of practice and a 17th position in qualifying, ending his season. 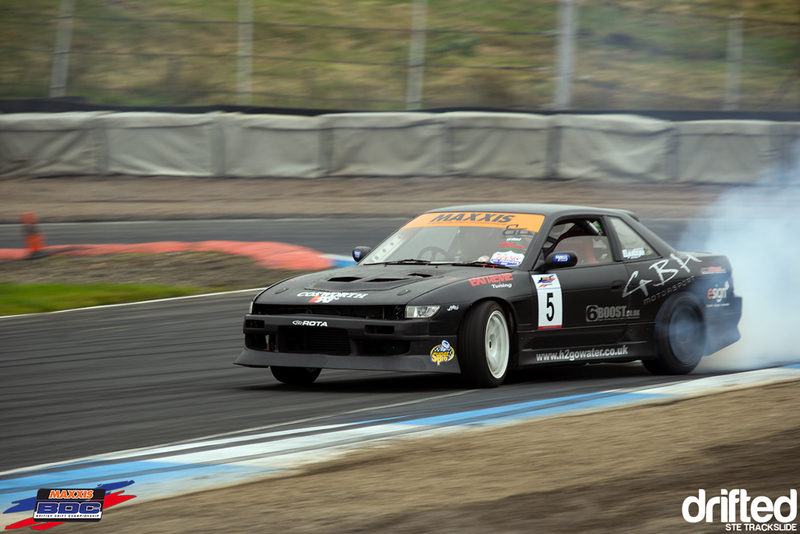 …and his driving was on point, netting him 13th position. 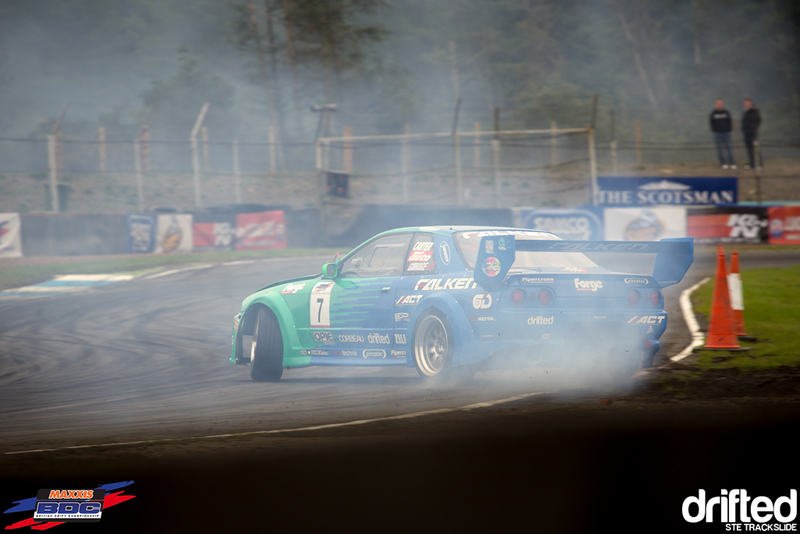 Team Falken’s Matt Carter was in attendance with a vengeance. 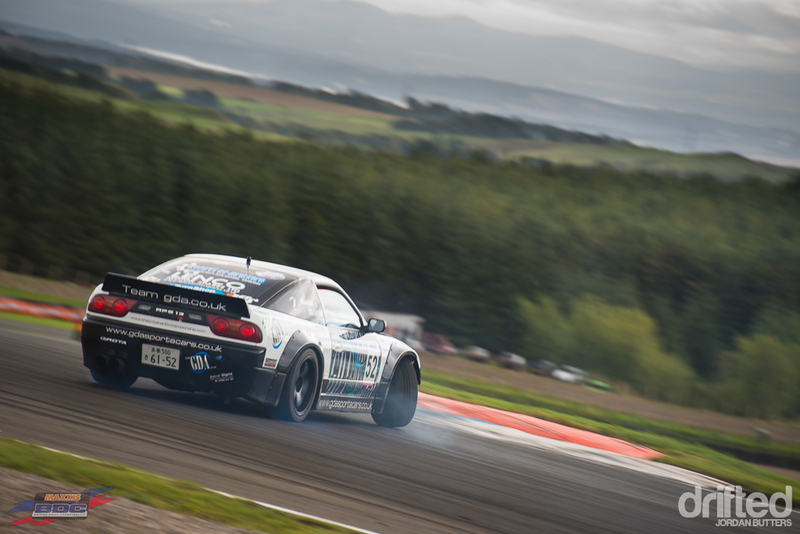 A rough season for Carter saw him chasing a good result in the final round. He took 14th qualification. 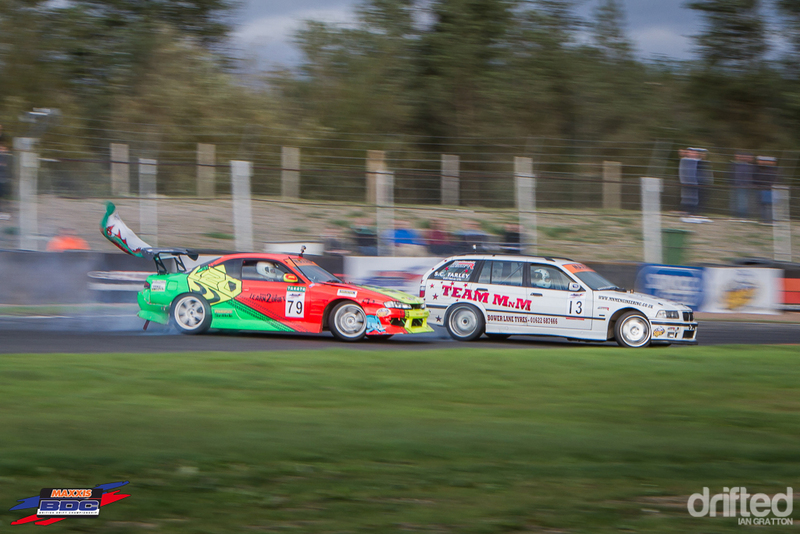 …whilst fellow Irishman Alan McCord resided in a respectable 10th. 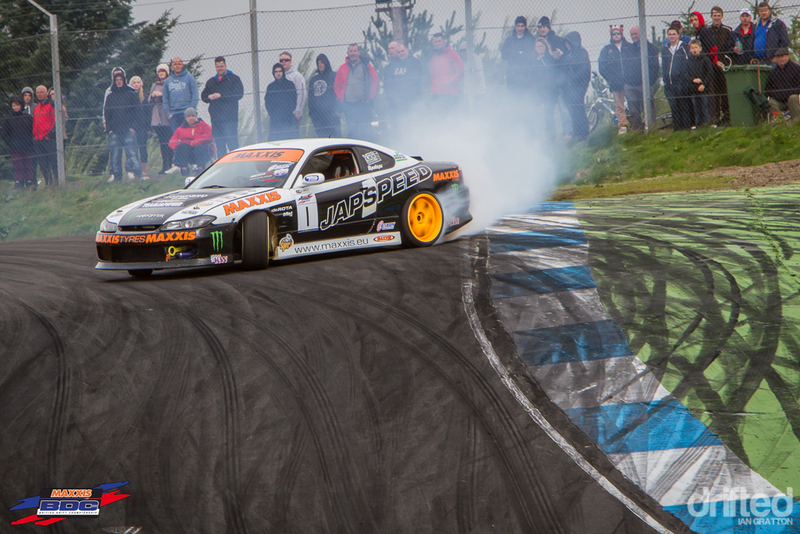 Another visitor, Australia’s Luke Fink, was pulling some incredible lines and runs in practice, displaying some of the most aggressive twin-drifting we’ve seen all season. 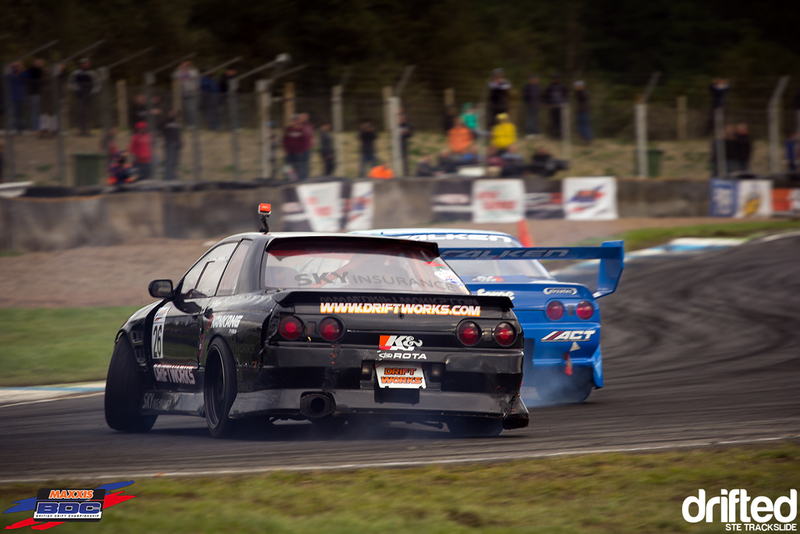 Luke qualified in 11th position, and would be one to watch closely in the battles. 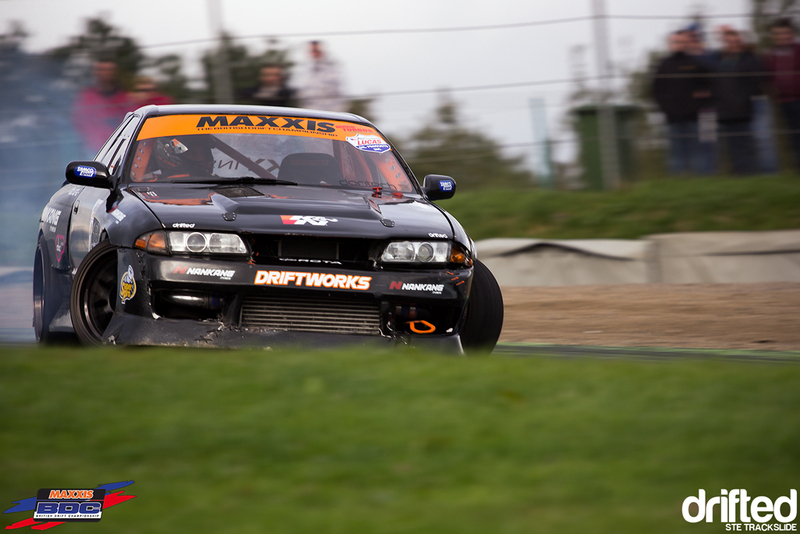 Driftwork’s Phil Morrison, another title contender took 3rd place, strengthening his championship campaign going into the battles. 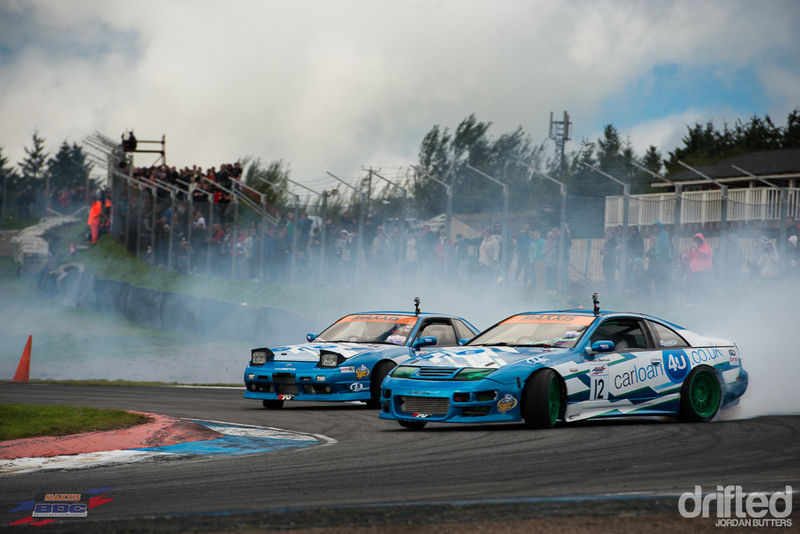 The Pro class was also open to contention, although leader Jay White’s strong first place qualifying position put him in a good position to win the title. 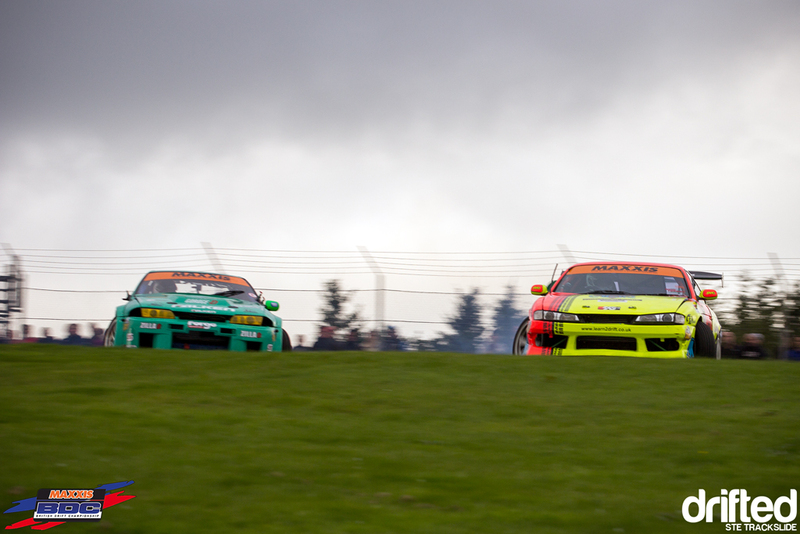 In the Semi Pro class there was another upset – Marcin Mucha, championship leader, failed to qualify, putting him out of the running for the title, too. 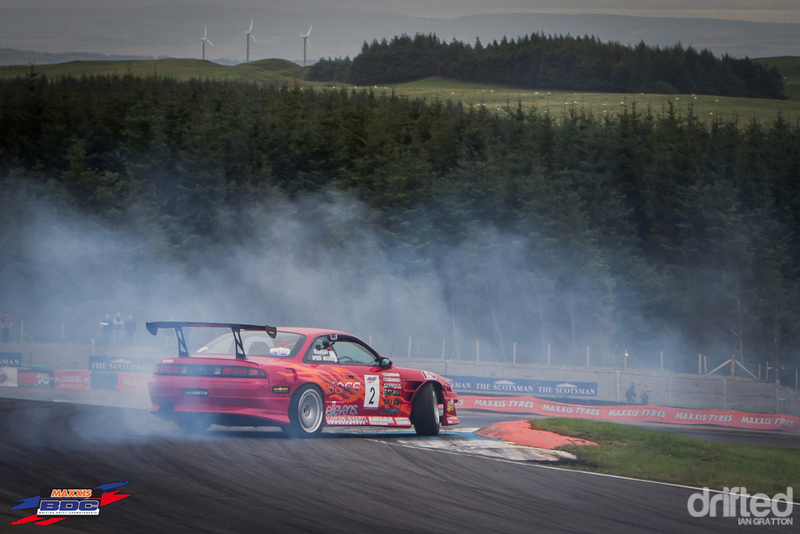 Semi Pro qualifying top spot was taken by Oliver Silcock instead. 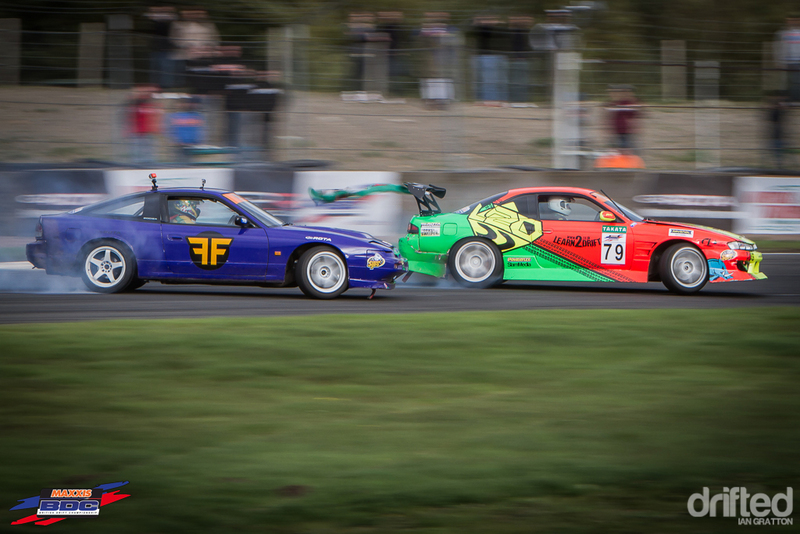 In the Semi Pro class battles, 16 soon became eight and then four. 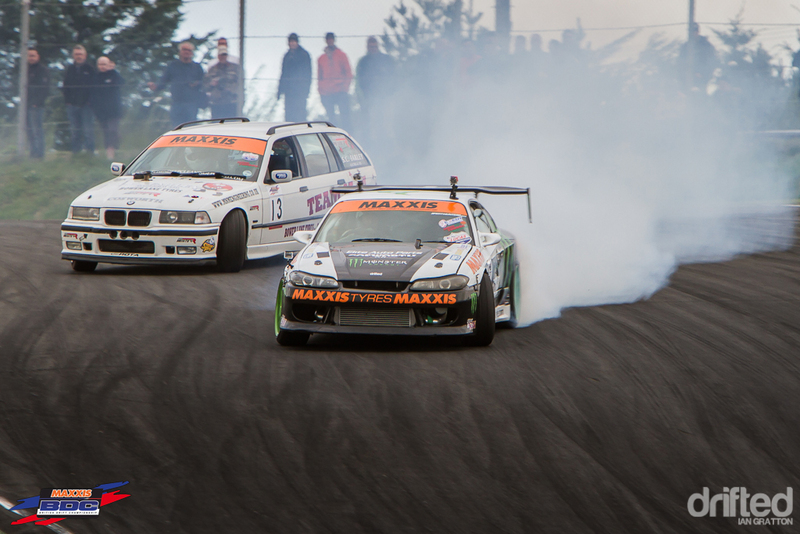 The finals would take place between Car Loan 4U team mates Joseph Ankers in the Onevia and Matt Samuel in the 300ZX. 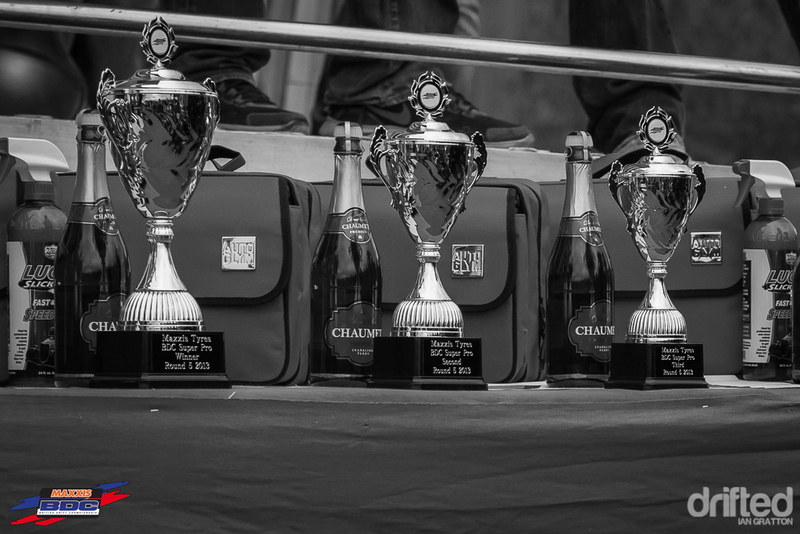 In getting this far, the team had already secured the team constructors title, but I’m not sure that they’d done the maths – if Samuel won, he’d win the Semi Pro championship – but it certainly didn’t seem like Ankers was following any kind of team orders! 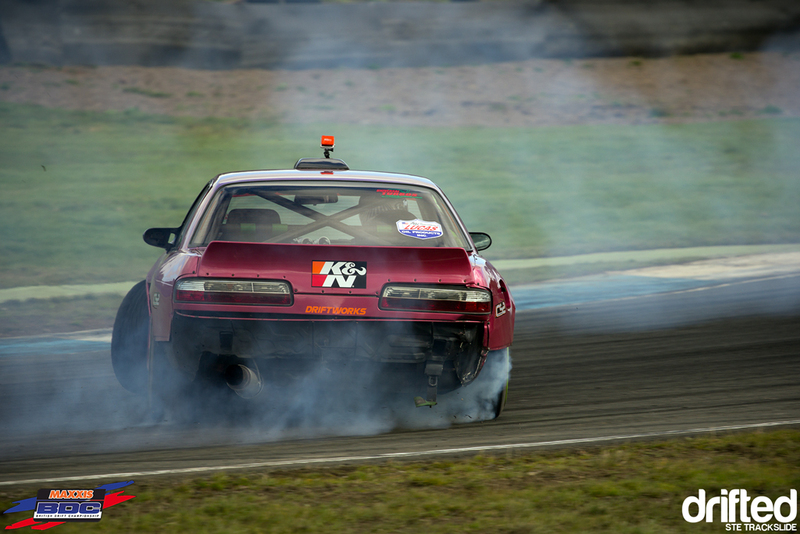 After two close runs the judges had made a decision, Samuel taking the advantage and taking the win, and with it the Semi Pro championship title. …where he’d meet with Gary Dunne. 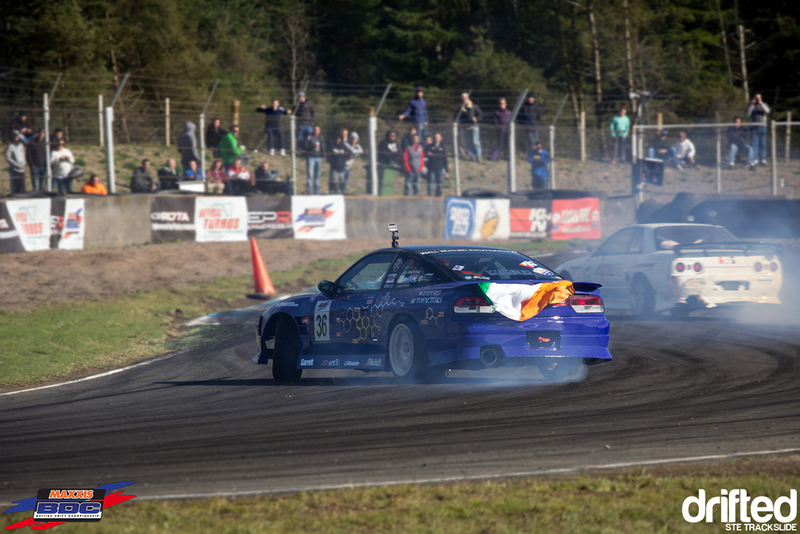 Dunne forced two one-more-times and a slight error in final run saw Dunne progress to the final. 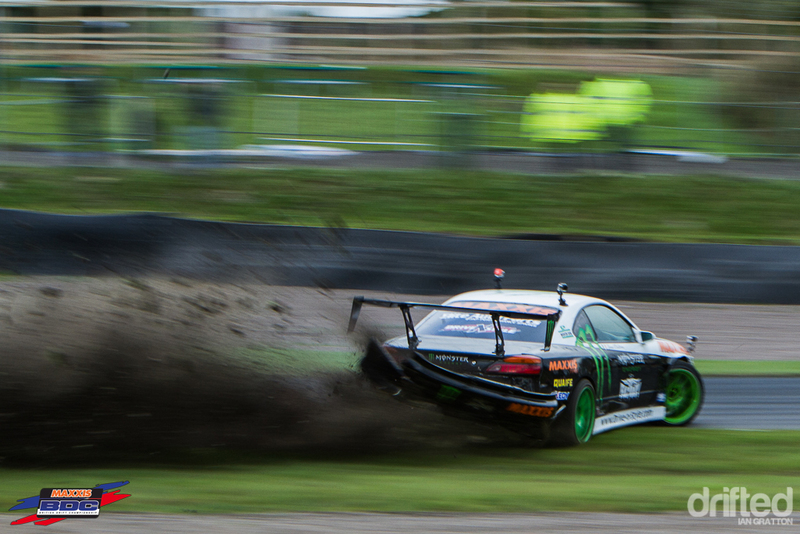 Cheshire was left to fight it out for third place, having upon launching from the line he blew a driveshaft. 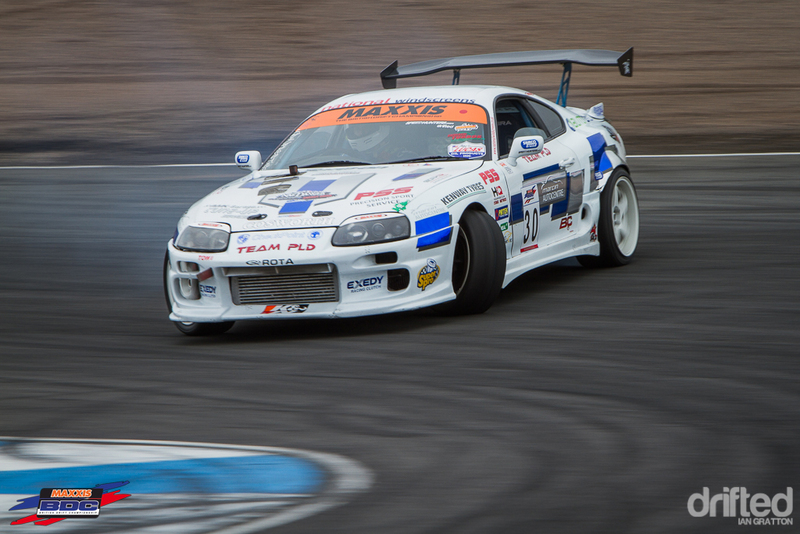 Nonetheless, the fourth-place win was strong enough to see him finish the championship in third and a promotion to the Super Pro class for 2014! In the other Semi Final TJ Berney bested Ben Manuel, putting him into the finals against Dunne. 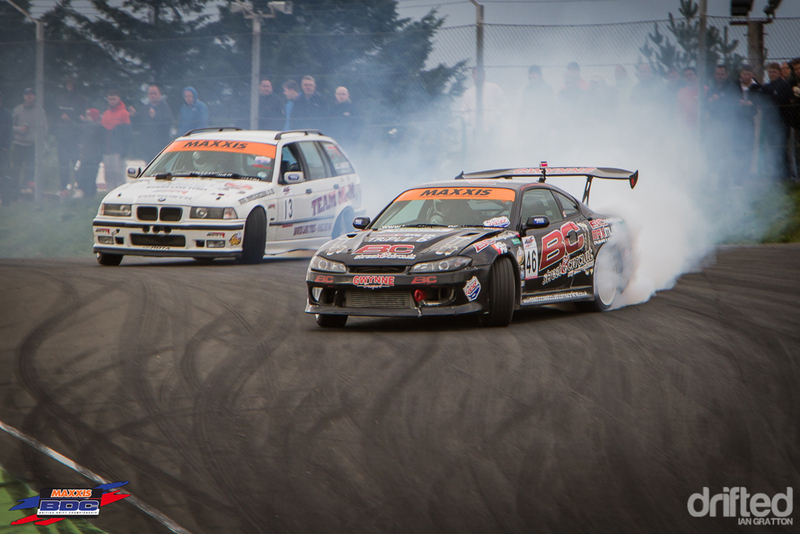 Close drifting followed, but the judges had seen enough – Dunne takes the win to end the season on a high. 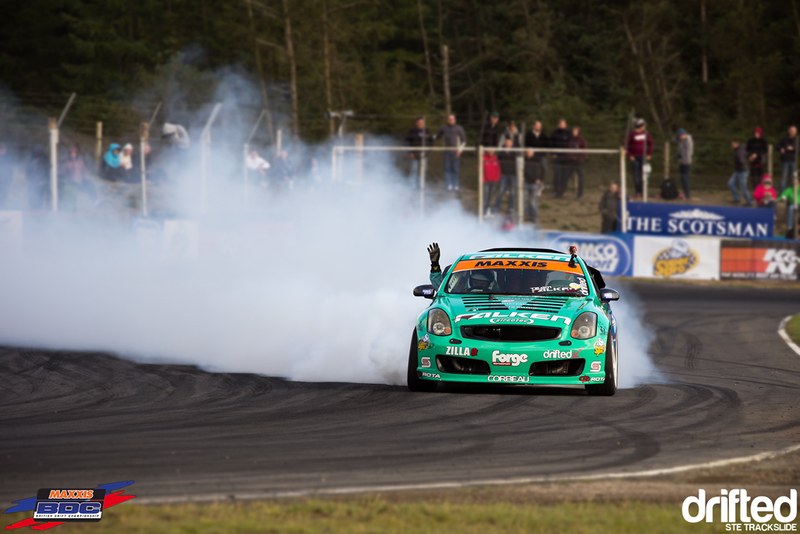 Despite only getting as far as the Top 8, Jay Green took the Pro class championship by just seven points over Jay White. 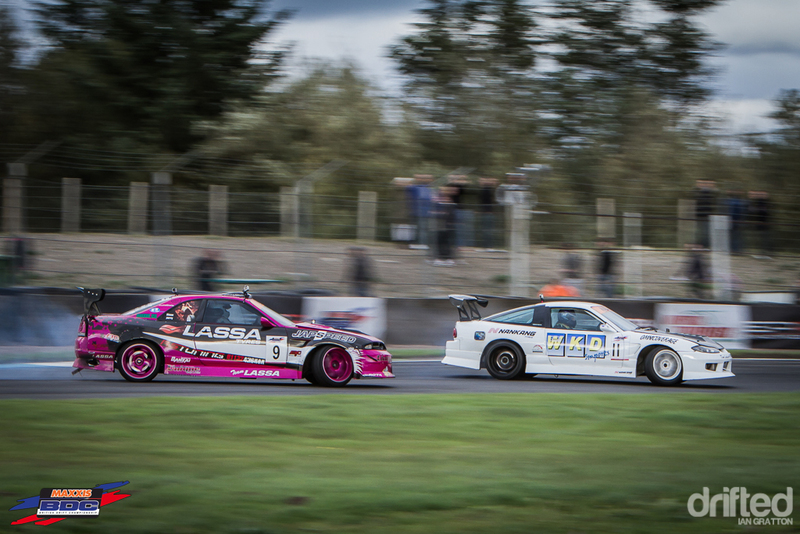 In the Super Pro class Lassa Tyres’ Simon Perry went up against Acorn Motorsport’s Stephen ‘Baggsy’ Biagioni. Baggsy fought well but Perry fought better, progressing to the Top 8. 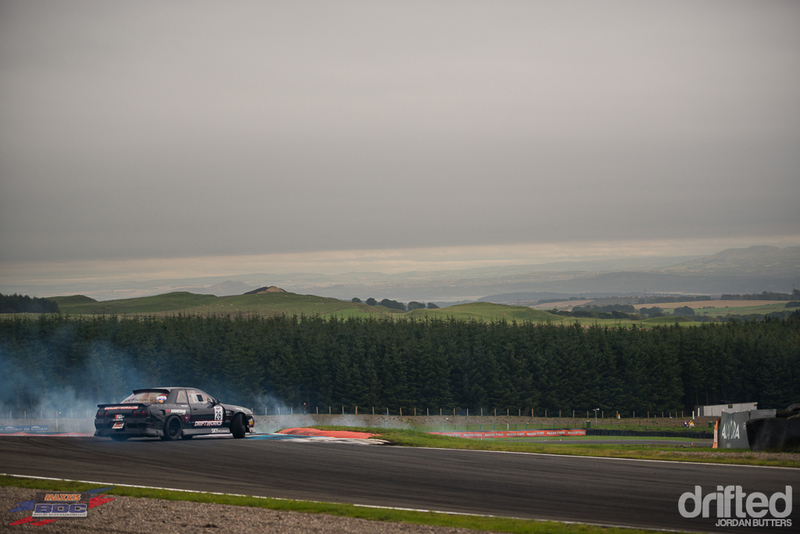 …but a spillage on the track from a previous battle saw Moore slide into the gravel, handing the progression to Keeber. 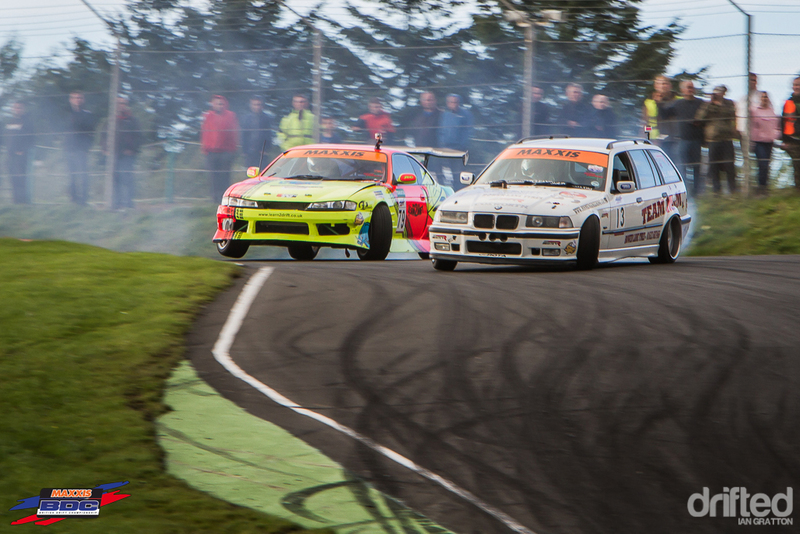 An all-Irish battle was next, with BDC regular Wesley Keating facing newcomer Alan McCord. 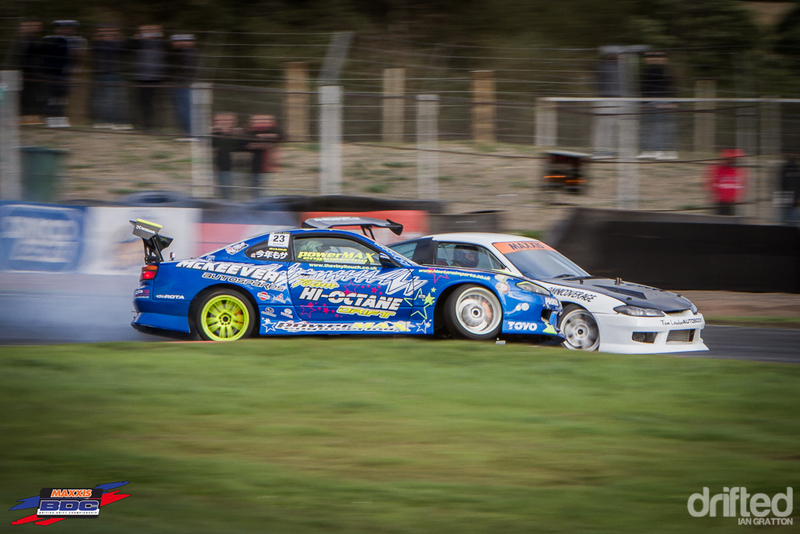 …who went on to face yet another of his fellow countrymen – Duane McKeever in the Top 8. 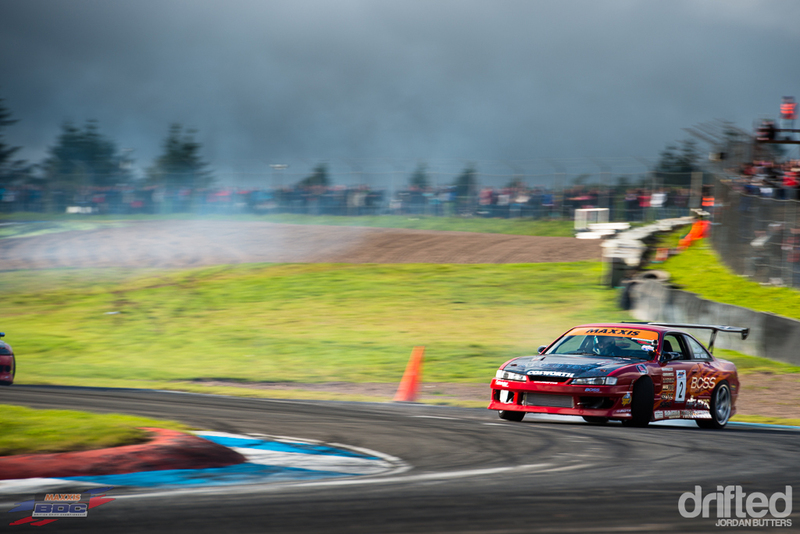 Keating was on a roll and quickly found himself in the Semi Finals! 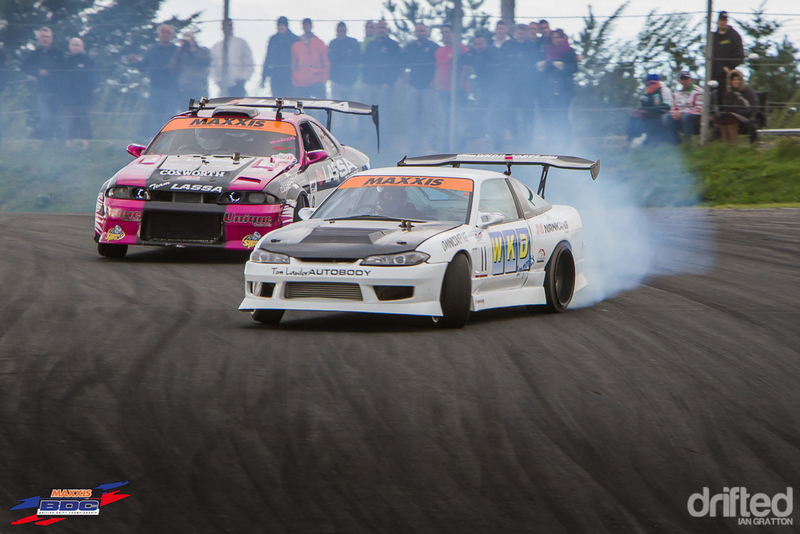 SSD driver Jamie Kenyon would have a tricky route to the finals… his first competitor being the super-aggressive Luke Fink. Nevertheless Kenyon held his own and mistakes from Fink saw Kenyon into the Top 8. 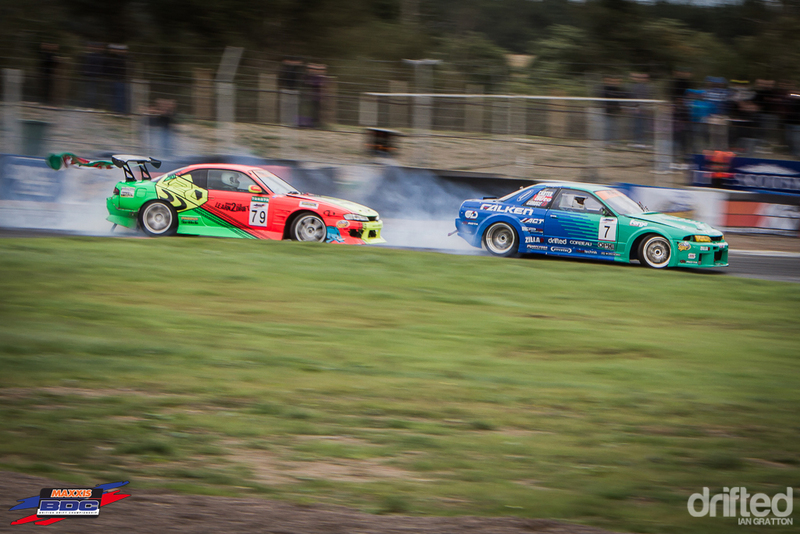 Falken driver Matt Carter was out for blood at the final round, and his first victim would be Driftworks’ Phil Morrison in this battle of the R32s. Morrison driving well but flawless runs from Carter saw him progress. After two battles, Kenyon’s giant slaying run continued and Carter was sent packing! 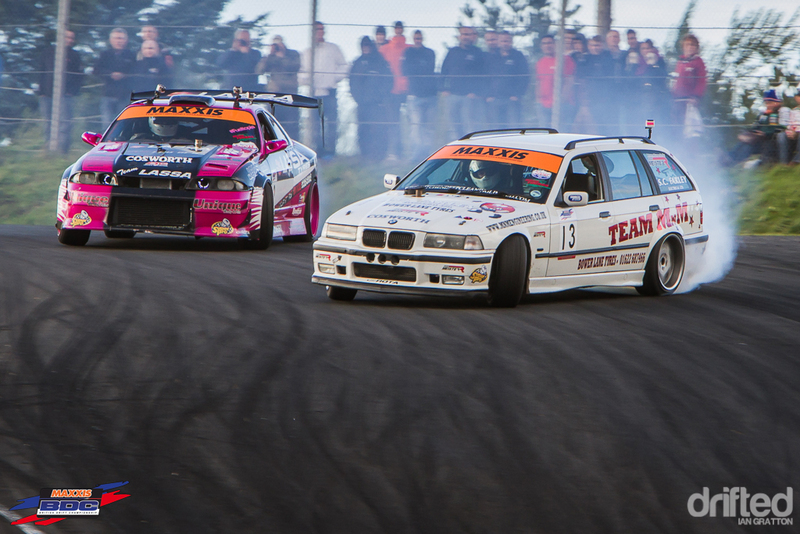 Also in the Top 16, Paul Conlan in the S15 faced championship contender Michael Marshall in the 2JZ E36 Touring. 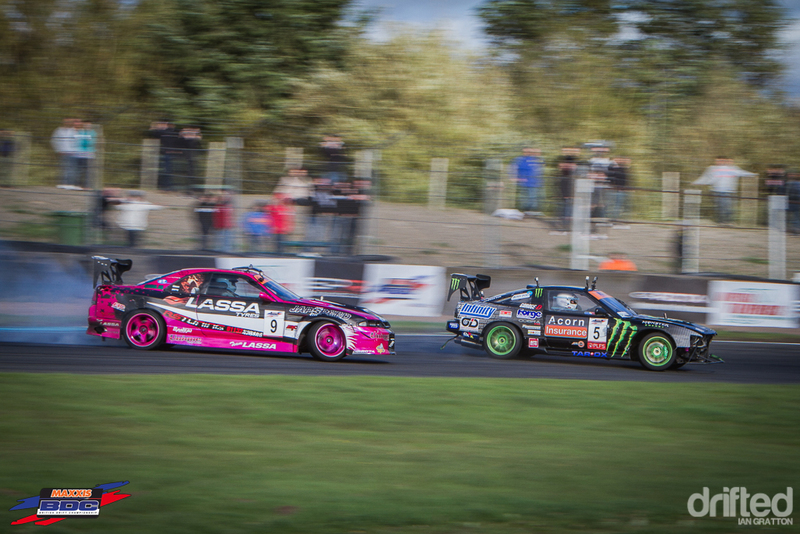 …where he met top qualifier Shane O’Sullivan. 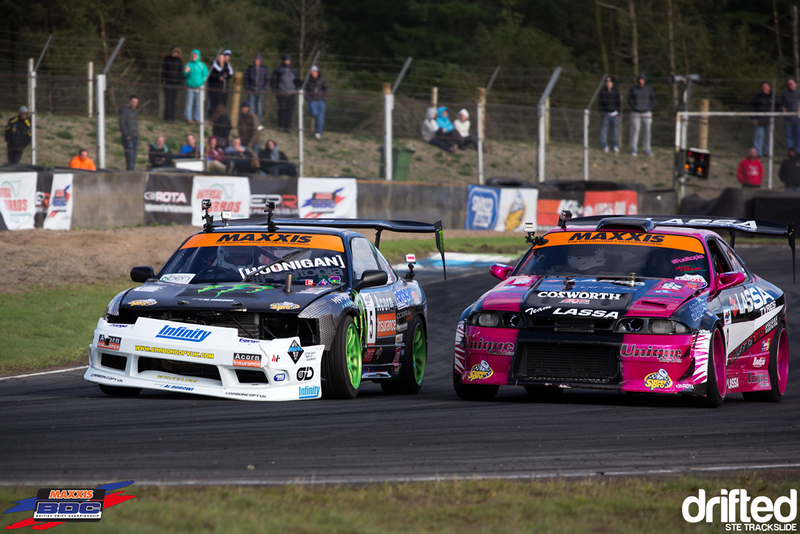 O’Sullivan ready for battle, having just dispatched Lassa Tyres’ Jo Fletcher in the pink S15. 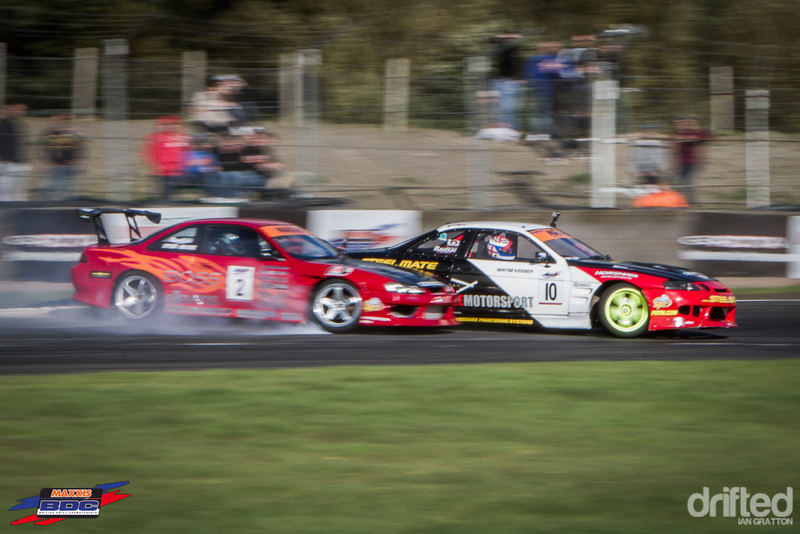 Marshall Vs O’Sullivan was one of the most aggressive battles we’ve seen all year, neither driver giving an inch…But it was Marshall who progressed on to the Semi Final! 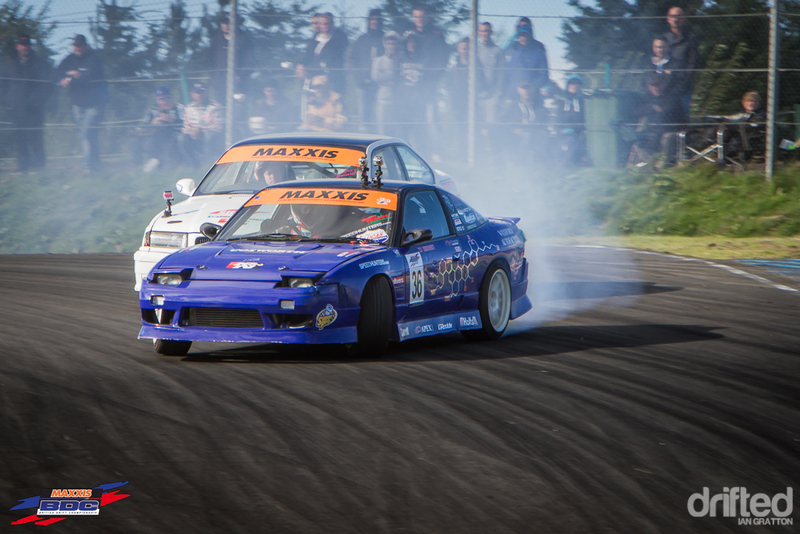 Smon Perry was the final driver to make it to the Semi Finals, after out-driving Wayne Keeber in the Toyota Soarer. 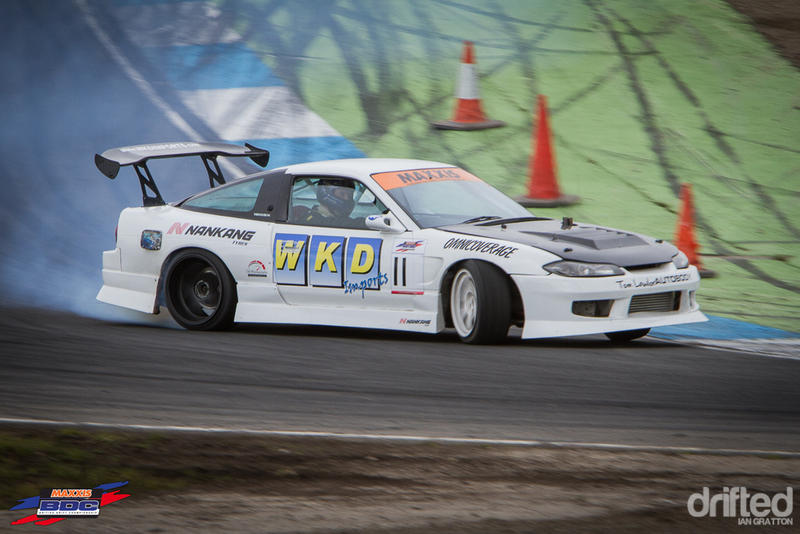 Perry would face Wesley Keating in the immaculately-prepped WKD 180sx. 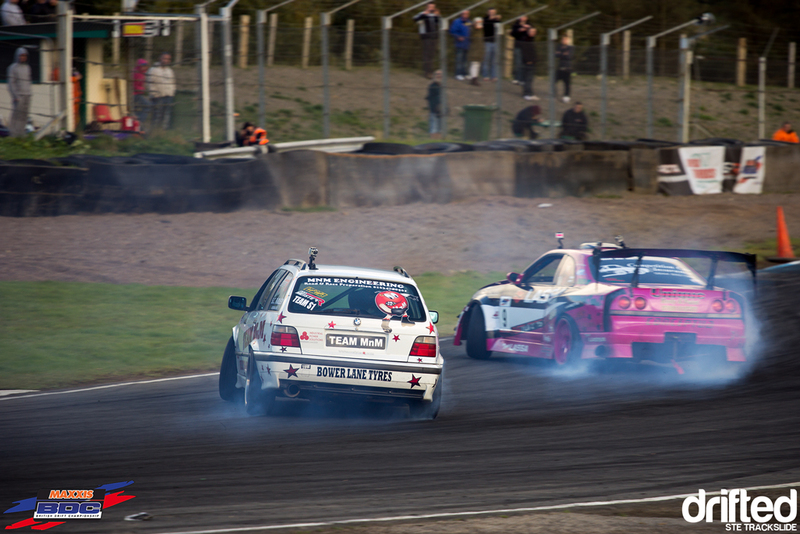 Both drivers being known for their ‘never back down’ style of driving, this was sure to be a good one. It would be Keating who would shine on this occasion, booking his place in the Finals. 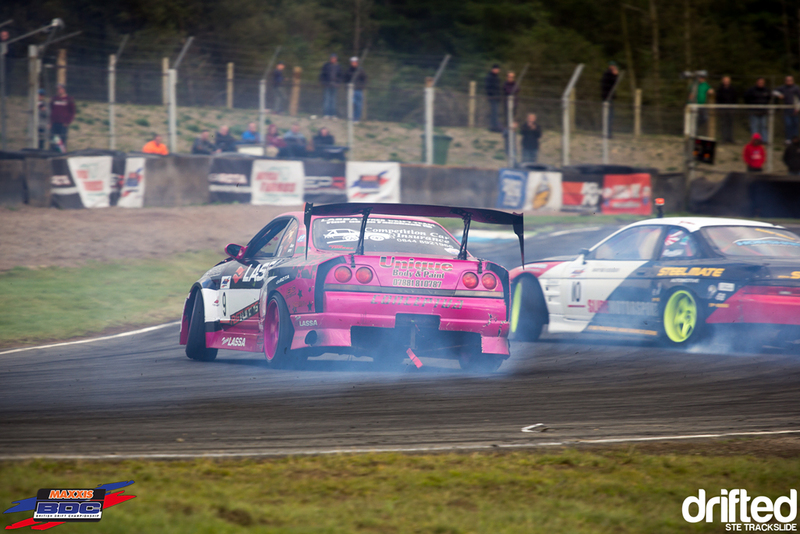 In the other Semi Final, Jamie Kenyon in the brighter-than-sunlight SSD S14 met championship runner Michael Marshall. 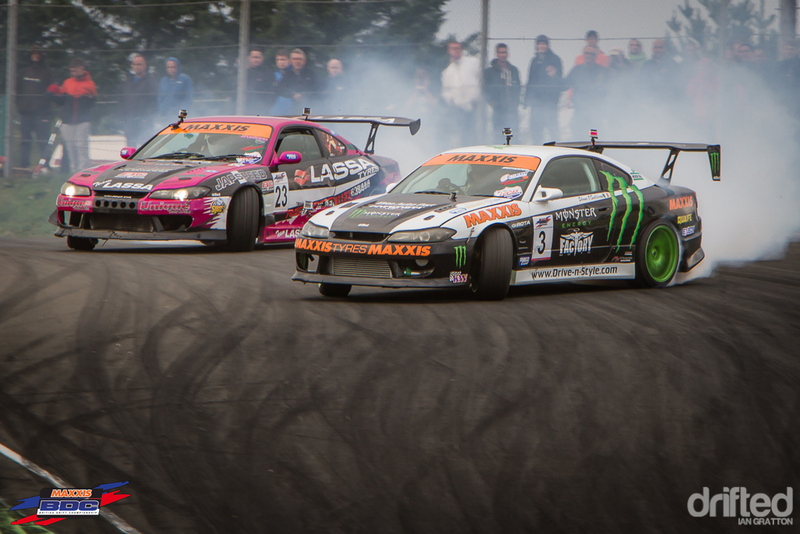 Simon Perry vs Michael Marshall – the winner of this battle would be 2013 British Drift Championship champion! 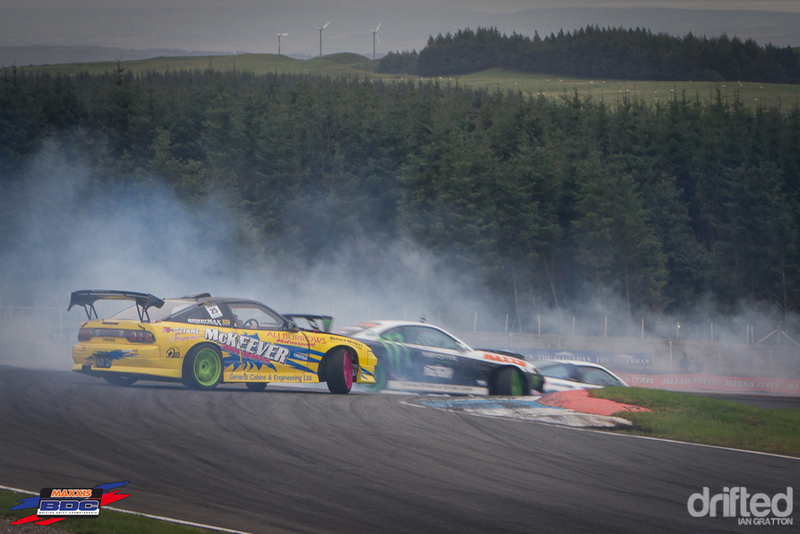 …but a great chase run from Marshall saw him take third place and with it the title! 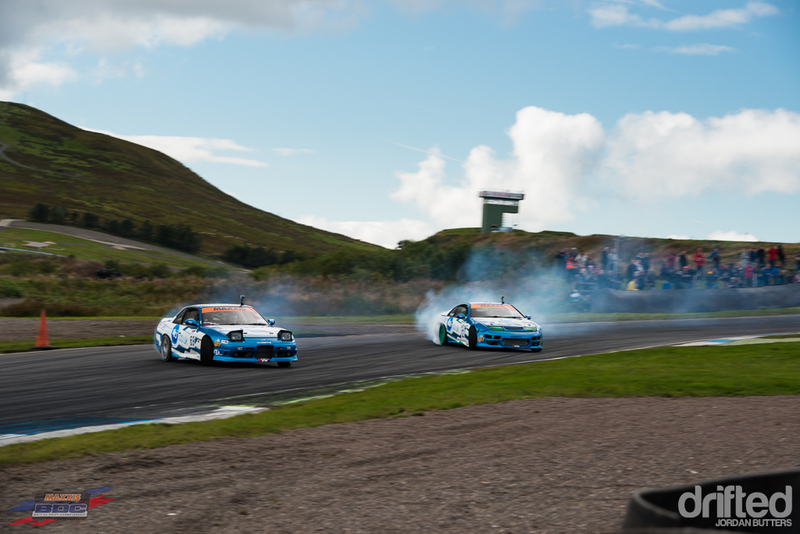 A mistake by Keating on the final run sealed a great day for Jamie Kenyon, securing his first win in the Super Pro class and hoisting him to 6th in the final championship standings! 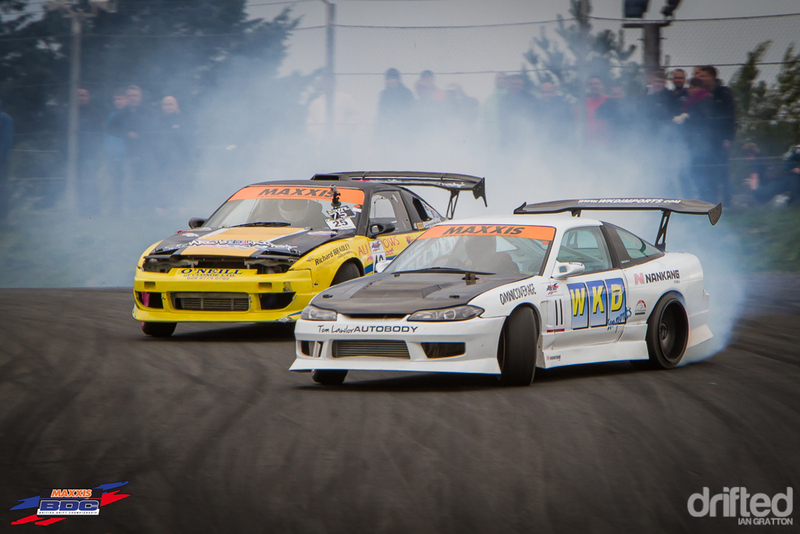 That concludes another amazing season of the Maxxis British Drift Championship. 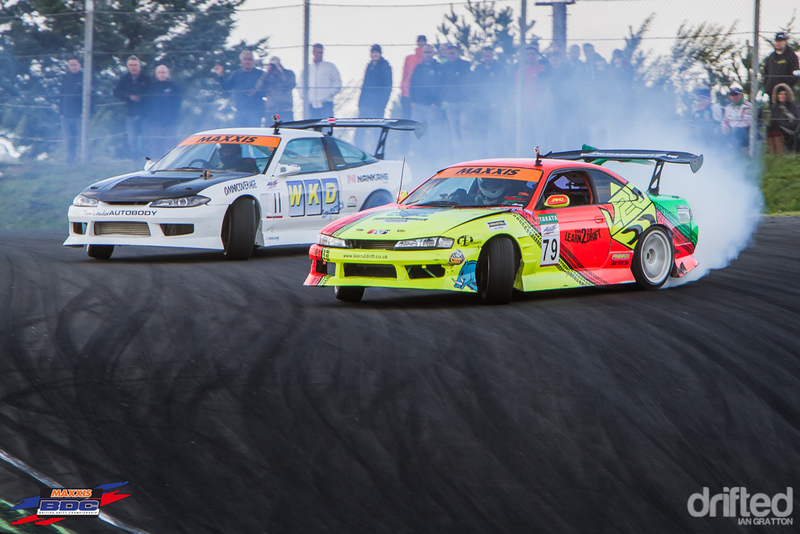 The driving that we’ve witnessed this year has been beyond anything we’ve ever seen before, cementing the BDC’s place as one of the world’s premier drift championships. 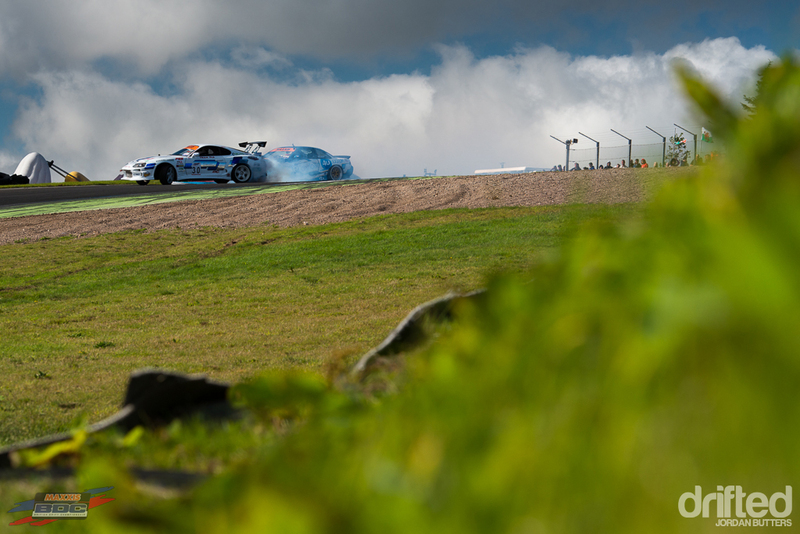 I’d like to extend a huge thank you to the team at the BDC for all of their hard work as well as the drivers, fans and fellow media for a great season. 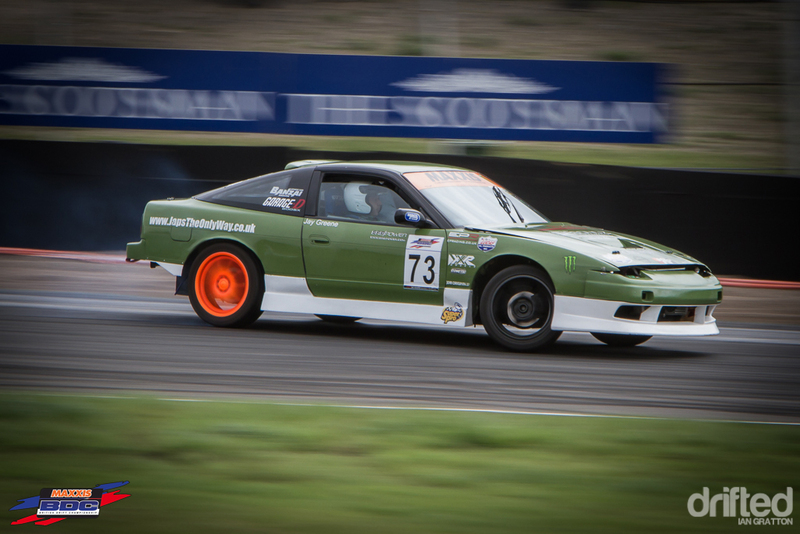 Also to our amazing photographers Ian Gratton and Ste Trackslide for all of their hard work throughout the year, without whom putting this together would be impossible. 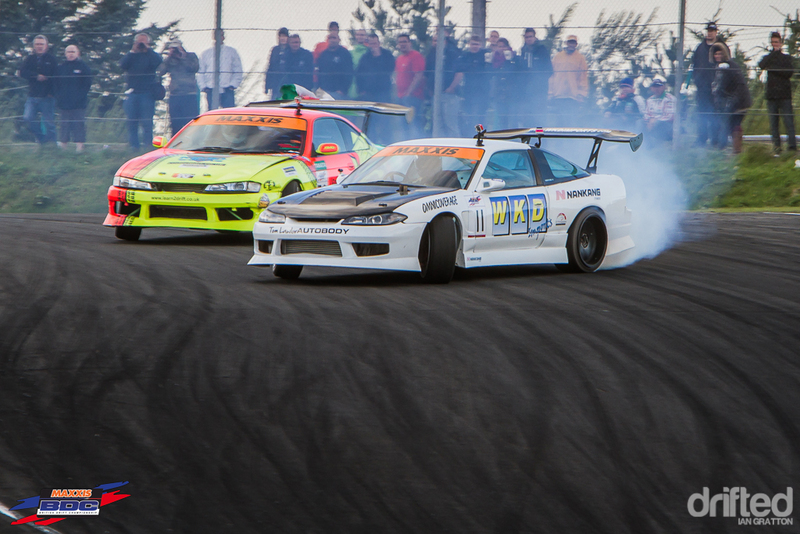 I can’t wait to see what the BDC holds for us in 2014! 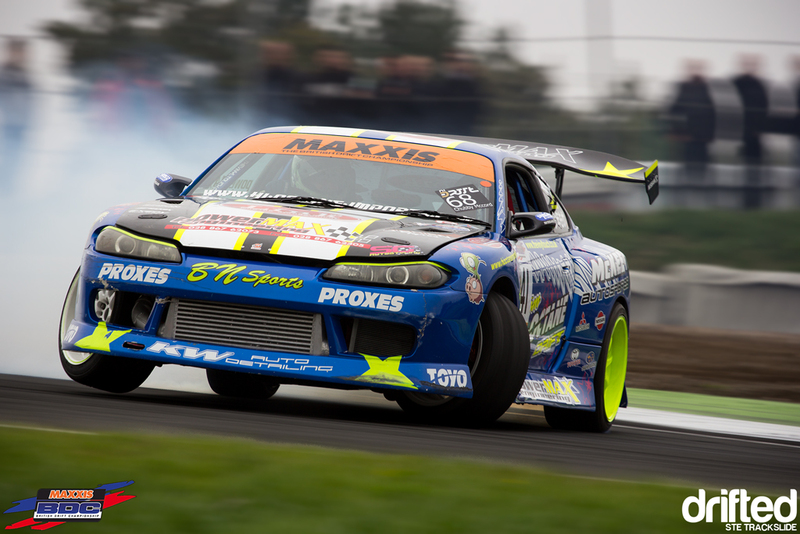 Drifted is proud to shine the spotlight on Max Cotton, one of the UK's most exciting, talented and youngest drifters.